During a vist to Bagram Air Base - the nerve center of American operations in Afghanistan - CNN's Nick Paton Walsh takes a look at the sacrifices members of the U.S. military have made in America's longest war. America's veterans are proud of their military service, but in a new report published Wednesday, they expressed ambivalence about the wars in Afghanistan and Iraq. In a new Pew Research Center report on war and sacrifice, half of post-9/11 veterans said the Afghanistan war has been worth fighting. Only 44% felt that way about Iraq, and one-third said both wars were worth the costs. Some of those costs were outlined in the Pew study, which comes out as the United States marks the 10th anniversary Friday of the Afghanistan conflict, the longest-running war in the nation's history. For instance, four of every 10 veterans reported they had difficulties adjusting back to life at home after the combat zone, and 37% said they suffered from post-traumatic stress, even though they might not have been formally diagnosed as such. "The ambivalence that many post-9/11 veterans feel about their military mission has a parallel in the mixture of benefits and burdens they report having experienced since their return to civilian life," the report said. An Air Force combat controller describes how he saved lives while injured in Afghanistan and earned the Air Force Cross for valor. CNN's David Ariosto talks with U.S. Marines in Helmand Province about the future of the fight, the drawdown and where they were September 11, 2001. The story of a 10-year-old who posted an iReport honoring his dad who died in the recent Chinook helicopter crash in Afghanistan has sparked a huge outpouring from CNN.com readers. It was Braydon Nichols' desire, his mother, Jessica Nichols, told CNN that his dad not just be another faceless casualty in the nearly decade-long war. The boy wanted the world to see his father's face, just as news reports showed the faces of other soldiers who lost their lives in the crash. So on his iReport, Braydon posted a picture of Army Chief Warrant Officer Bryan Nichols, a pilot, in his jump uniform sitting next to other soldiers. "Braydon wanted people to know that Bryan was a daddy and a good daddy," his mother told CNN. Joshua's mother, Margarita, says "we miss and love him very much and are anxious for him to come home." Submit a salute of your own by visiting the special Morning Express with Robin Meade Salute To Troops assignment page at: iReport.com! More than two dozen American troops are believed to have died in a deadly Chinook helicopter crash in eastern Afghanistan overnight, a U.S. military official told CNN on Saturday. Among those killed were a mix of special forces from different services, the official said. If the numbers are confirmed, the incident would be the most deadly for coalition forces in the Afghan war, according to a CNN count of international troop deaths. Sgt. 1st Class Leroy Arthur Petry lost his right hand in Afghanistan tossing a grenade away from fellow soldiers. An Army Ranger who lost his right hand while tossing an enemy grenade away from fellow soldiers in Afghanistan was awarded the Medal of Honor Tuesday. Sgt. 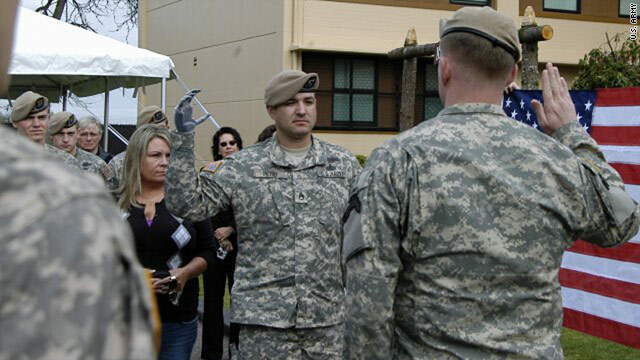 1st Class Leroy Arthur Petry became the second living recipient of the Medal of Honor from the Iraq and Afghan wars, according to the U.S. military. "Leroy Petry showed that true heroes still exist, and they're closer than you think," said President Barack Obama, who presented the award to Petry. "It's very humbling to know that the guys thought that much of me and my actions that day, to nominate me for that," Petry said, according to an Army News Service report. Petry was awarded the medal for his actions on May 26, 2008, in Paktia, Afghanistan. A team, along with journalist Nick Paton Walsh, embedded with U.S. troops at Combat Outpost Pirtle – King in Afghanistan. You'll see what day to day life is like for these soldiers fighting a war, but you'll also see what it's like to face the ultimate adrenaline rush as they encounter deadly gunfire. While the CNN team was there covering fighting from the side of the troops, they came perilously close to bullets raining down upon their camp.